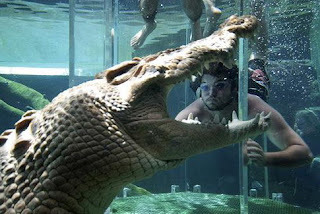 Crocosaurus Cove in Darwin, Northern Australia, presents the tourist attractions of unusual adrenaline triggers. There, there is a pool containing crocodiles and you can go into it. Do not miss this rare opportunity get into the pool contains a crocodile while on holiday to Darwin, Australia. Located at 58 Mitchell Street, a crocodile named Crocosaurus Cove provides an unusual tour. Here, you have a chance to see the pool contains a lot of crocodiles. Once inside the Crocosaurus Cove, do not be surprised to see a large crocodile-free swimming in the aquarium glass. Yes, visitors are immediately confronted with a giant aquarium containing dozens of large crocodiles. Crocosaurus Cove spy of the site, there are about 70 crocodiles in captivity this. Here, you can lure the crocodile, alligator learn about life, and most adrenaline rushing was swimming with alligators. The first activity of the most common visitors while in Crocosaurus Cove is a giant aquarium visit. In the aquarium, you can see dozens of crocodiles swimming in the aquarium contains 200,000 liters of water. One of the most famous crocodile species is Barramundi, famous saltwater crocodiles in Australia. 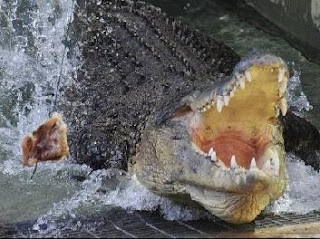 The best time to visit the aquarium is at 11.00 local time, it is time feeding the crocodile in a way to dive. Later, visitors can see alligators caregivers will dive into the pond and feed. Another best time to visit the aquarium is at 15.30 local time. At that time, you can see the crocodiles being fed from the pool water surface. Fun! Other activities are no less exciting to see the crocodiles in the crocodile pond is fishing. Just imagine, fishing with a crocodile as its object! Together are like fish, crocodile fish is done by a fishing pole and bait in the form of meat. Want a more challenging? Here it is the most exciting activities and a mainstay in Crocosaurus Cove: swimming with crocodiles. There are two ponds that provided Crocosaurus Cove. The first pool is designed specifically for children and a baby pool adjacent to the crocodile, limited only by the glass. Jump into the pool, and a baby crocodile was found swimming in the pool next door. Well, for adults, swimming latter place. Here, your adrenaline will be triggered by direct entry into a pond containing crocodile. Relax, do not have to worry about safety. You see, visitors who enter the pool would first put into a transparent glass box, like a cage. First of all incoming travelers are required to complete in a cage in a swimsuit. Then, the cage was lowered into the pool of adult crocodile. You were given 15 minutes when in the cage. Feels incomplete when a trip to crocodile breeding reptiles life without knowing it. If you want to know more about the ins and outs of crocodile, crocodile come to the museum is still in the Crocosaurus Cove. There, you can find a crocodile is preserved, also rangk-order crocodile. The museum is open daily from 09:30 to 18:00 am local time, the same as the load time Crocosaurus Cove.